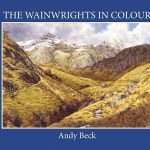 Summary: Wainwright’s eye must have been drawn to the name, position and possibly shape of Eagle Crag when he was drawing up his lists as it features on all of them and of course has its own chapter in the Pictorial Guides. 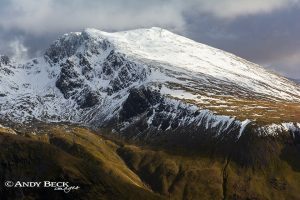 Unlike many of the fells on his list Eagle Crag did not have a measured height, the nearest being on the neighbouring Sergeant’s Crag. As a consequence of that AW made an approximation of the fells hight- 1650′, but this guess was well out by about 70′ which is an unusual error on his part. The reason for this error may be explained by the confusing contour lines near the area of Heron Crag on his 1 inch O.S map. 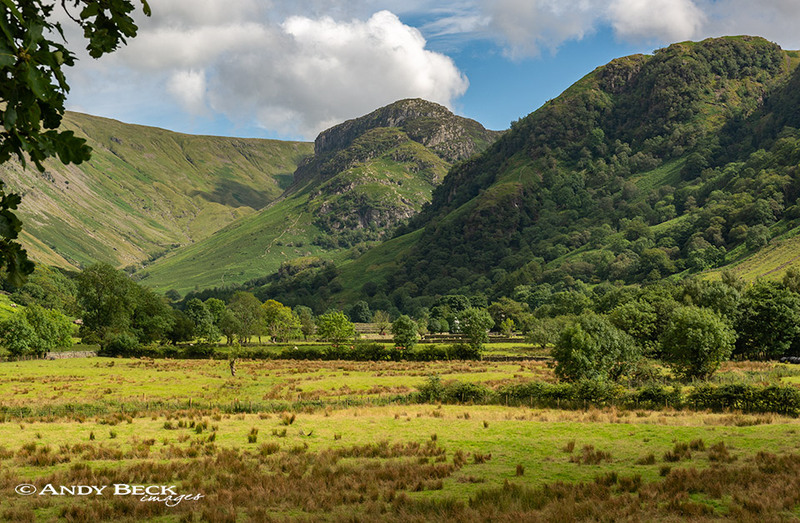 Eagle Crag is a shapely fell when seen from the north, it forms a dividing wall between the beautiful Langstrath valley and the valley of Greenup Gill. There are really only two direct routes of ascent for walkers from the small hamlet of Stonethwaite. Either the easier route via Greenup Gill and the approach to the summit from the col between Eagle Crag and Sergeant’s Crag or the more exciting ascent up the front of the fell which zig zags through terraces of heather and rock. The summit is defined by a large slab of sloping rock from where there are excellent views of the Borrowdale valley. Topographical details: As mentioned above, Wainwright’s approximated height of 1650′ is well out. The true height is 1722′ 525m GR: NY27533 12102. On the large platform of rock of the summit there was for a long time a small neat cairn, it had been there so long that the rock underneath was bleached and free from lichen- see the photograph below. Sadly, that cairn has been cast assunder and now the rock is either bare or has a few stones in place which are not permanent. The high point at the edge of this rock is the Wainwright summit. Points of interest: Many fells can be seen from the top of Eagle Crag with only the south-east aspect being blocked by nearby Ullscarf. There are good aerial views of the Borrowdale and Langstrath valleys. Waterfalls: There are several small falls in Greenup Gill as there are in Langstrath Beck where it joins Greenup Gill. The best fall is perhaps Galleny Force on Stonethwaite Beck. Adjoining fells: Sergeant’s Crag, easily reached via a short ridge route. Nearest facilities: Car parking limited free parking in Stonethwaite village (do not impede local traffic). The Langstrath Inn offers food and accomodation and there is also a small tearoom in the village. Campsite in the village at Stonethwaite Farm. 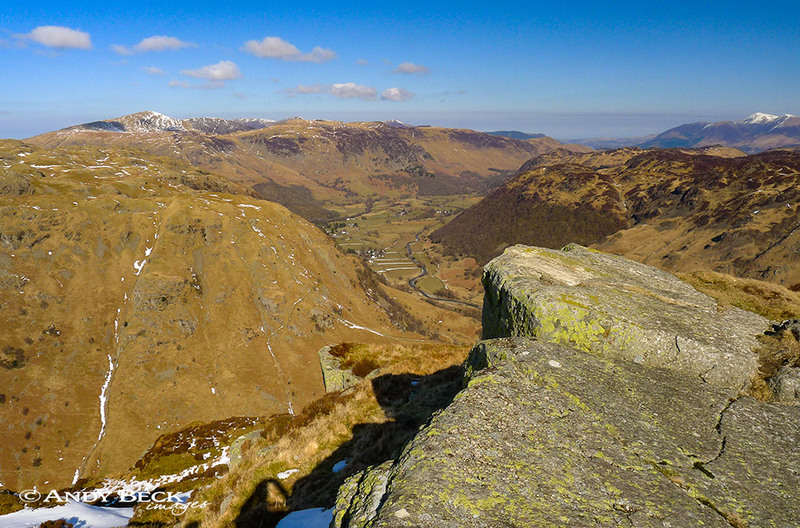 Star rating: (2.4 / 5) Eagle Crag is a fine small fell, neatly positioned with good views. Options of easy or more difficult ascents make it user friendly. Handy for local facilities.